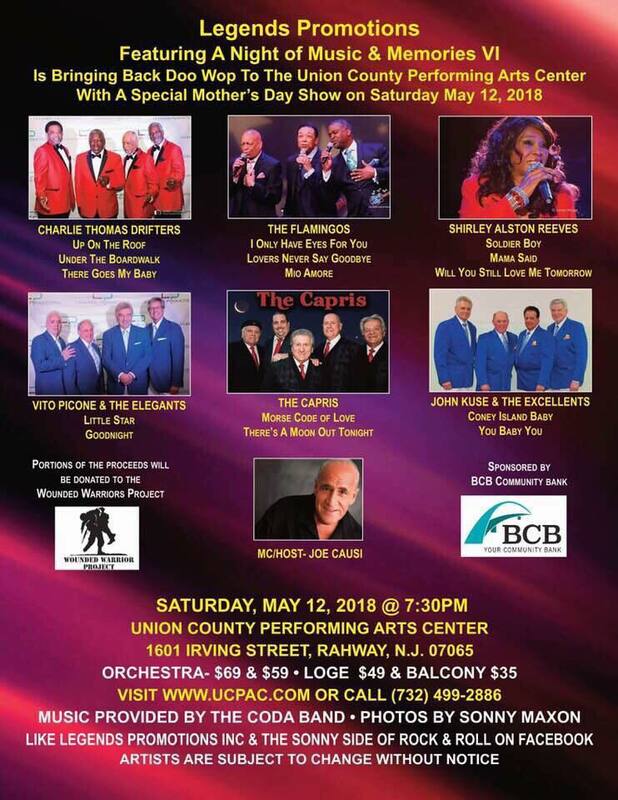 Legends Productions’ “Night of Music & Memories IV” will feature Charlie Thomas’ Drifters, the Flamingos, Vito Picone & the Elegants, John Kuse & the Excellents, the Capris and Shirley Alston Reeves in this star-studded concert. It takes place at the Union County Performing Arts Center, 1601 Irving Street, Rahway, NJ 07065 on Saturday May 12 at 7:30 PM. The host will be Joe Causi and music will be provided by the Coda Band. Tickets are $35, $49, $59 and $69. For tickets visit www.ucpac.com or call 732-499-2886.